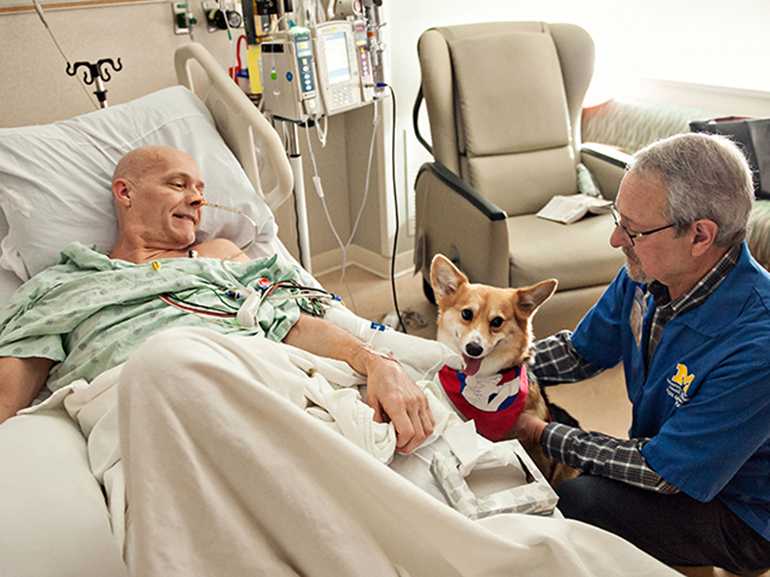 Bree, a Pembroke Welsh corgi, and her owner, Howard Rush, meet with a patient at Michigan Medicine. Three days a week, Bree happily makes the rounds. 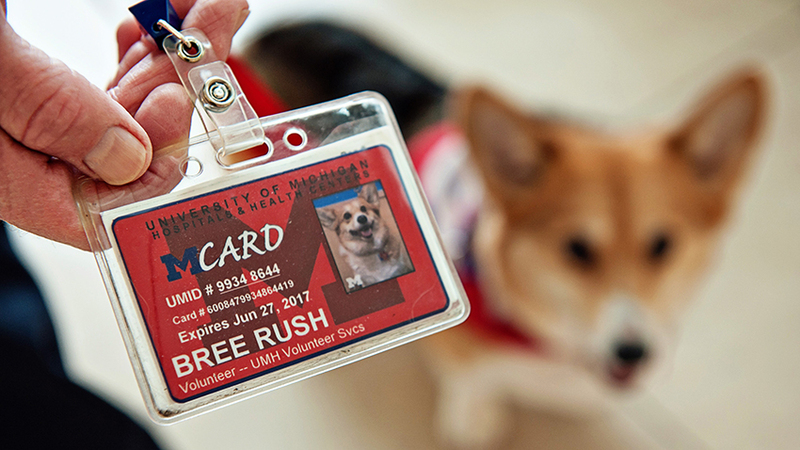 The energetic, 6-year-old Pembroke Welsh corgi is a frequent sight at Michigan Medicine. Her proud owner, Howard Rush, accompanies the four-legged visitor. The duo are a part of Therapaws of Michigan Inc., a canine-assisted therapy program dedicated to promoting the human-animal bond. That special connection has proven to be good medicine for patients. Since 1988, Therapaws volunteers and their canines have brought smiles and companionship to patients at Michigan Medicine facilities during scheduled visits. Together, Rush and Bree visit C.S. Mott Children’s Hospital, units 7A and 7B in the main hospital and the Frankel Cardiovascular Center. Traveling from room to room, they spend time with 10 to 15 patients during each visit. For Rush, a retired U-M Medical School faculty member and veterinarian, the decision to volunteer his time, and that of his beloved Bree, was an easy one. Rush sees the impact firsthand with every visit. Bree even gets her own volunteer badge when she visits the medical center. Many patients are enthusiastic, particularly those who have dogs or cats at home and miss their pets. And, because dogs weighing less than 40 pounds are allowed in hospital beds, patients are thrilled to learn that Bree can snuggle up with them. The therapeutic visits are rewarding for everyone involved. According to the Human-Animal Bond Research Institute, positive human-animal interaction has plenty of benefits. It has been shown to influence blood pressure, heart rate and hormones correlated with well-being, including cortisol, oxytocin, prolactin and dopamine. On a deeper level, therapy dogs “take in everyone’s anxiety and emotions and really seem to calm people. It’s one step closer to home,” said Rev. Lindsay Bona, manager of the Spiritual Care Department at Michigan Medicine. Still, the animal has incentives. At the end of each visit, Bree is rewarded with a few biscuits for a job well done, followed by a well-deserved nap when she gets home.